Let me just start out this post with an “oy vey.” Ugh. 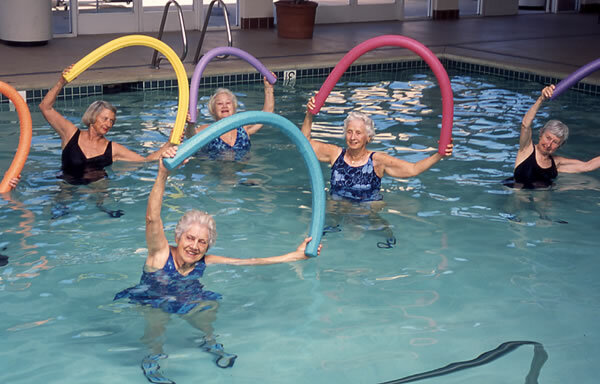 Okay, backing up a bit…Tuesday after work I hurried to the gym to get in a swim before the water aerobics class took over the pool at 6:30. I was happily surprised to see that the pool wasn’t crowded. It’s usually so crowded during the week I avoid it. But last night I had the lane all to myself! It was awesome. I swam as fast as I could to get my workout done in the short time I had. I finished my 1 mile in 35 minutes with 5 minutes to spare. It felt fantastic! Definitely a different kind of swim. It felt like I’d just run intervals for 35 minutes straight. I was also hurried because Michael and I had dinner reservations. We were having a Date Night. Normally we don’t have our Date Nights during the week but his friend Jeremy is coming for another visit today. He’s currently living in Ireland and trying to move back to Oregon. He’ll be here for another three weeks trying to find a house, get his driver’s license, etc. 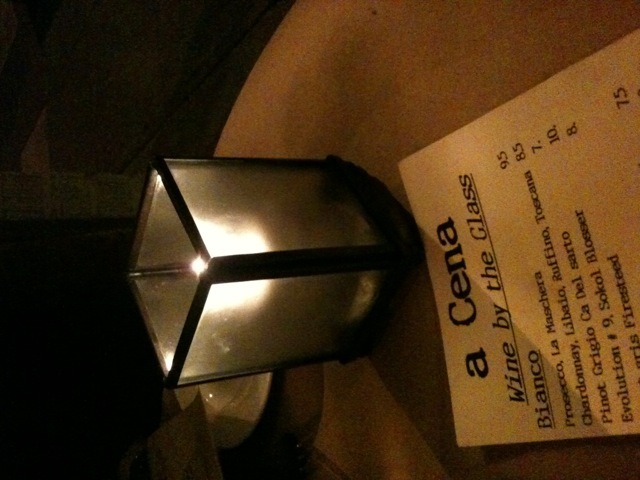 I made reservations at a nice little Italian joint in Sellwood called A Cena. That’s a photo of the table we had by the window. It was a cute little restaurant and we were the only people in the little nook so our table was even more intimate. The music playing was lovely Italian and tango music! Just what I’ve been listening to a lot lately. It was perfect. I ordered a glass of Pinot Grigio. They brought a bread basket to the table. 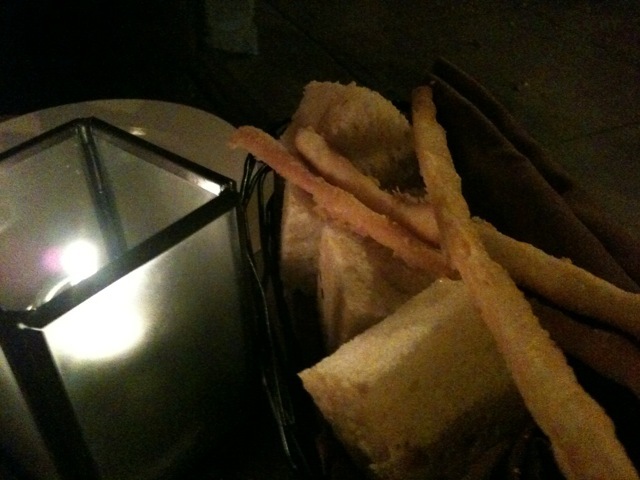 It came with two crunchy bread sticks and then foccacia bread. The foccacia bread was amazing. It was thick and spongy like cake but with a crispy, salty top. The olive oil was sweet. Delicious! 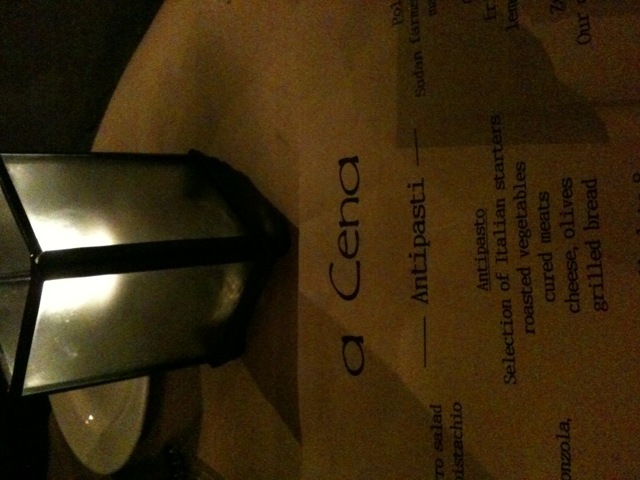 We ordered the antipasti plate (small). It came with two different kinds of salami and meat, an assortment of olives, tomatoes and peppers, crispy bread, a hunk of bleu cheese and figs covered in truffle honey. I wish the photos had turned out better. We munched on the appetizers and then the waiter came out with bad news. Somehow the kitchen had lost our entree order! It was so strange! But they were sending out a complimentary dish to tide us over while they made dinner. It was a bowl of ravioli: corn and mascarpone ravioli with Maine lobster. Oh. My. God. It was probably the best thing I ate last night! 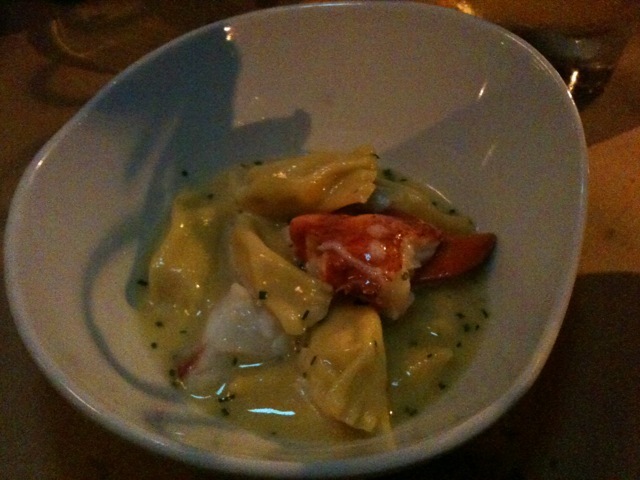 The ravioli was sweet from the corn, soft and buttery and the lobster was the perfect flavor to go with it. I did not mind that they lost our dinner order after eating such a rich dish! Our entrees arrived. 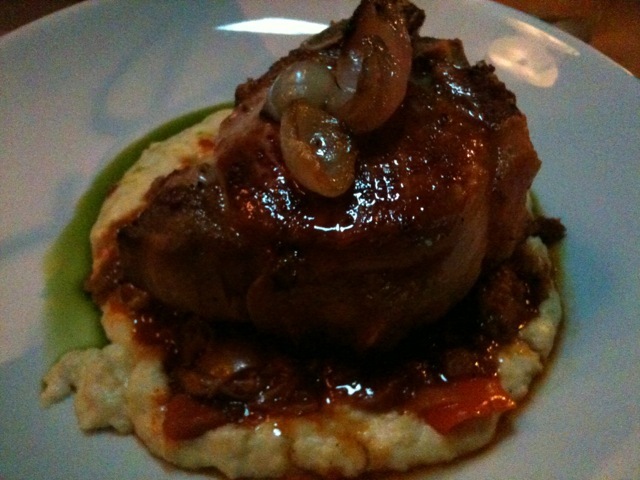 Michael got the steak (which was tender and delicious) and I got the pork chop with soft polenta, sage and an onion marmalade. There was also pesto. 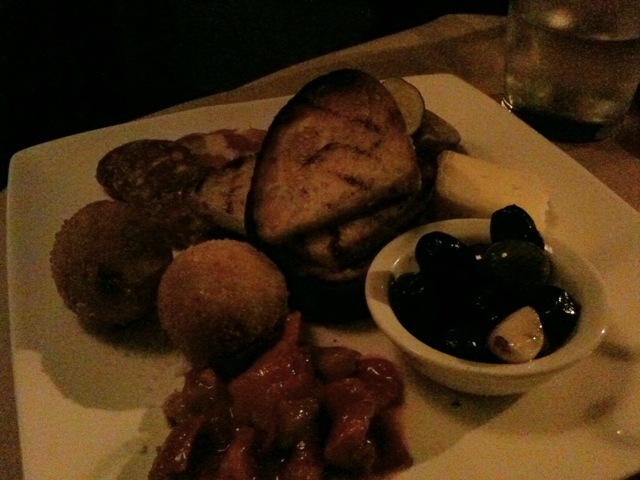 I’d eaten so much foccacia bread, antipasti and ravioli that by the time the entree came I knew I couldn’t eat it all. It was wonderful! 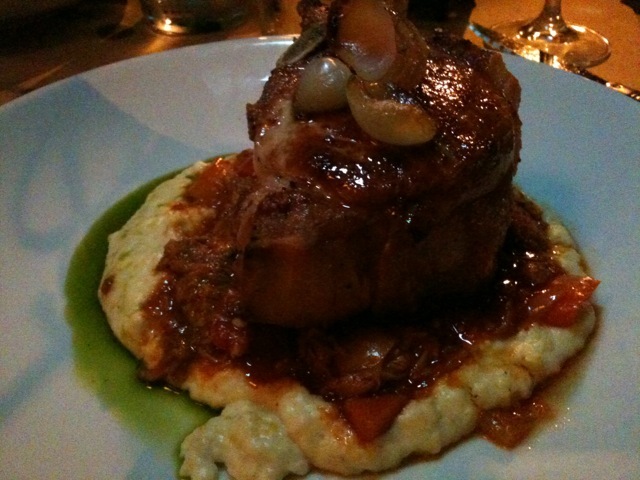 The polenta was so creamy I thought it was mashed potatoes at first. The onions were sweet and soft. The waiter brought us a third drink! On the house. He was very apologetic about the dinner being late. 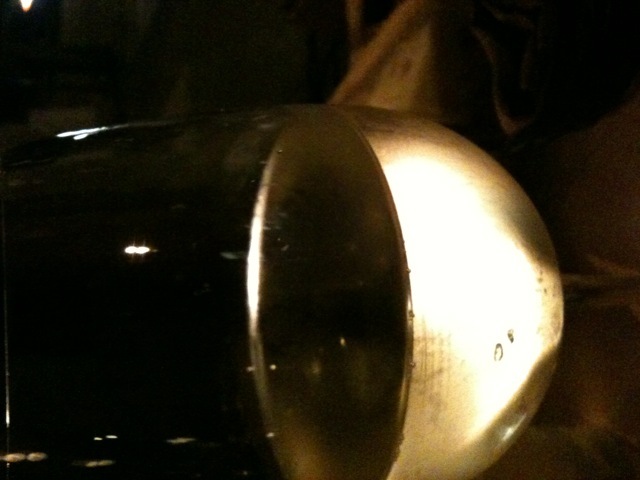 I was already a bit tipsy from having just two glasses of wine with dinner. I did not finish that third glass. We got home late and I passed out and slept like the dead. I woke up this morning with a dang headache but coffee seemed to cure that. QUESTION: Have you ever made your own ravioli? If so, how did it turn out and what recipe did you use? Your Dinner looks good, It makes me want to make a date and go to a fancy italian restaurant! Wow, looks/sounds like an amazing meal! I have never made my own raviolli but I have been wanting to. If I did, I would probably make a simple ricotta and basil. Love your blog! You really are an inspiration! Thanks Jenny! I’ve never made my own pasta but it’s on my list of things to try! Wow that sounds like such a fun night! I need to start implementing date night. I’ve done the wonton wrapper kind and every time, halfway though, I swear I will never make them again. Those suckers are time consuming! And mine usually end up leaking all over the place anyway. Marscapone + corn + lobster sounds absolutely heavenly, though. Mmmm. Glad you kicked the mini-hangover this AM! I bet it’s pretty time-consuming. It will have to happen on a day when I’ve got nothing to do! *yeah right! That’s on my life’s to do list: learn make ravioli (i’m not being sarcastic). I want to be the kind of woman that whips up a batch of ravioli, tosses a quick salad and dressing, and then sits down to eat it with a glass of Pelegrino in a spotlessly clean house and watch great chick flick on TV. Just as soon as the Puff turns 18. In the meantime it’s all Yo Gabba Gabba 24/7 at my house, with dog hair and crud all over the floors. I’m not laughing! That’s on my life list too! It must have been a super duper wine because I’m usually not a lightweight like that!